We usually think of scones as sweet, not savory. 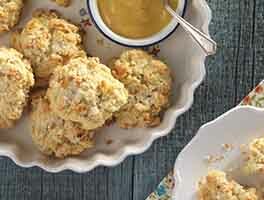 But these rich, tender scones are packed with chunks of cheddar cheese and diced bacon, and accented with fresh chives. Serve them with soup or a salad for a satisfying meal. Recipe updated 1/4/18: see "tips," below. 22 mins. to 24 mins. Preheat the oven to 425°F with a rack in the middle to upper third. Lightly grease a baking sheet, or line it with parchment. Whisk together the flour, salt, baking powder, and sugar. Work the butter into the flour until the mixture is unevenly crumbly, with some of the butter remaining in larger pieces. Mix in the cheese, chives, and bacon until evenly distributed. Add 3/4 cup of the cream, stirring to combine. Try squeezing the dough together; if it's crumbly and won't hang together, or if there are crumbs remaining in the bottom of the bowl, add cream until the dough comes together. Transfer the shaggy dough to a well-floured work surface. Pat the dough into a smooth 7" disk about 3/4" thick. Transfer the disk to the prepared baking sheet. Use a knife or bench knife to cut the disk into 8 wedges, spreading the wedges apart a bit on the pan. Bake the scones in the middle or upper third of the oven for 22 to 24 minutes, until they're golden brown. Remove them from the oven, and cool right on the pan. Serve warm, or at room temperature. 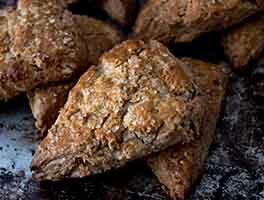 Refrigerate any leftover scones, well wrapped, for several days; reheat before serving. Freeze for longer storage. Make mini-scones: Divide the dough in half, and roll each half into a 5" round. Cut each round into 8 wedges. Bake in a preheated 425°F oven till golden brown, 18 to 20 minutes; or for about 25 minutes if frozen. 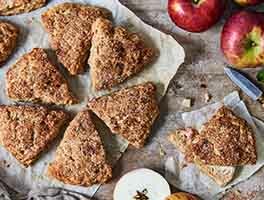 Thanks to feedback from you, our readers, we've reduced the salt in this recipe to produce a scone with better flavor. A wonderful recipe! At elevation you might need as much as a cup of the cream (flour gets VERY dry above 5000 ft.), and I chop the bacon up a bit more finely than the recipe says-but it seems like the scones don't crumble where the big pieces of bacon are in the dough anymore. 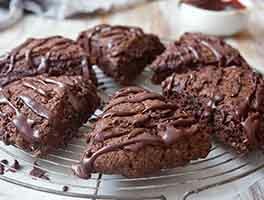 These are easy to make and a huge hit with everyone. Thanks! What a delicious recipe. I did substitute whole milk yoghurt for the cream and added 1/4 tsp baking soda and no bacon but oh my. They were fantastic. These were amazing. The hardest part of making them was not eating the cooked bacon. Simple and easy. I was looking for something to make for small bites and this seemed like jus t the thing. I used half and half and green onion tops ( was short and it was noticeable). Instead of a circle I formed the dough into a rectangle and cut in bite sized pieces. It was very good but decided next time to try sharp or extra sharp cheese and form the dough into a roll about the size of a quarter, slicing 3/4 inch thick. Bake at 400 for approximately 12 min. I think these will be delicious as part of a charcuterie and cheese board with fig jam. What a treat! I have never made scones before mainly because I have not liked the ones I've tried in the past. I read the reviews for this recipe and decided to try it. I did not have chives so I carmelized some onions but kept the recipe as is. Even my husband liked them and came back for seconds! I baked the full recipe and am freezing the baked left overs. I am interested in trying them from baked frozen. Thank you King Arthur for posting this wonderful recipe. 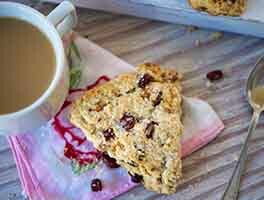 These scones are so delicious! I needed a lot more cream but I live in a very dry climate. They still turned out great.